Everyone has several apps in their device such as messenger app, travel app, photo app and so on. However, there are other kinds of apps present on iTunes store that could increase your productivity. People who belong from IT department can have file manager app, photo manager app, PDF viewer and any reminder app. Now I am talking about reminder app and their importance like what role these apps plays in your daily life and how these apps can save your time. Future Scheduler app is scheduler app that is available for iPhone, Android and Blackberry. It can schedule personal calls, birthday/anniversary text message, official emails and social media status updates for future date and time. Due to busy life it generally happens that you are stuck in office and you forget to wish your wife on her birthday. So, you can guess that what situation will be after reaching at home as you forgot to wish her birthday. Like thus, if someone is busy in office meetings and he/she needs to send an email to his/her clients or team about project report, then it is not possible to leave office meeting mid and go to send emails to team or client. Future scheduler provides ultimate solution for such problems. If there is need to call wife or other person to wish them on their special day, then these events can be scheduled. 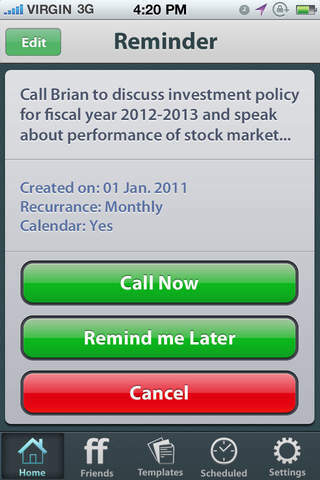 Future scheduler provides the option for call and text scheduling for future date and time. In this process, you only need to select contact from your iPhone and set any future date and time whenever you want to call or message to that person. If there is need to send text message, then you can type message and schedule that event for particular date and time. Future scheduler will send this message automatically to specific person. 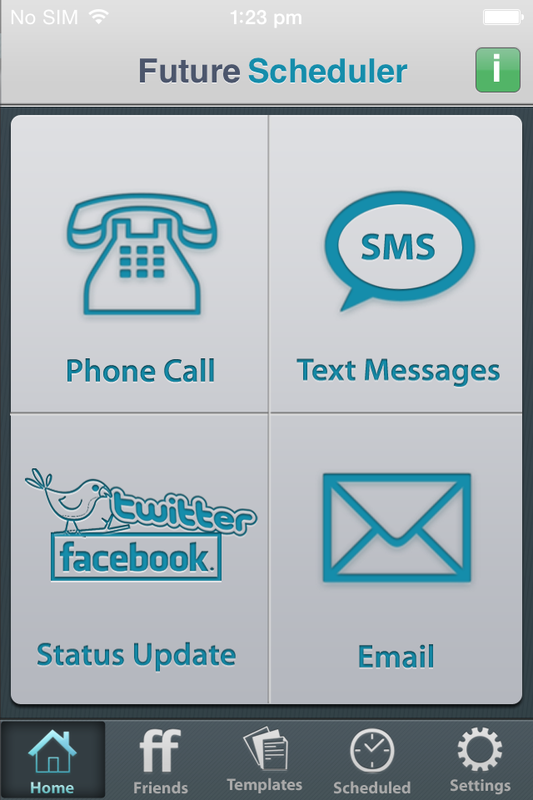 In the process of call scheduling, there is only need to select contact and time of calling, this app will call automatically or send reminder for calling. Therefore, you will not forget to wish your special ones on their special day. In case of email scheduling, only need to select email address (More than one email address can be add), type subject and email body and select date and time whenever mail is required to send. App will send email to specific email address at specific time. Same as social media updates can be done with the help of this app. Like thus, iPhone app work as personal secretary and assistant. App also has option if recurrence and snooze function so these functions can be used accordingly. ← Why Photos to Albums app is the Best Photo Organizer App?